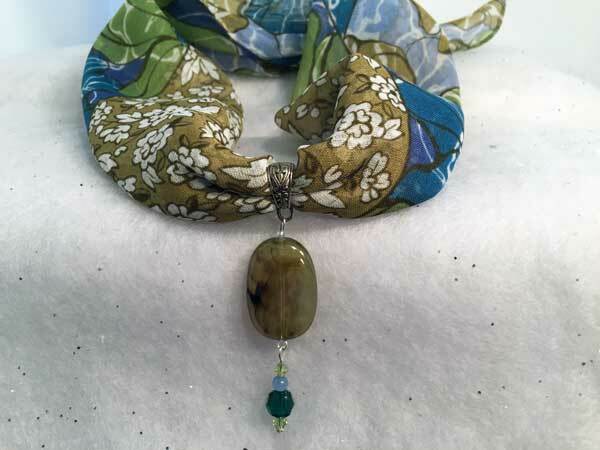 This scarf has a very unique combination of colors which starts with a shade that is something between a light brown and an olive green with small white flowers. Add to that large flowers in teal, chartreuse and periwinkle and you've got a combination that you might not expect to look so good together. The jeweled piece starts with an acrylic flat oval with swirls of colors from light-brown to olive green, similar to the main scarf color. Hanging separately from that is a beautiful, fully-faceted, deep teal glass round topped with a small periwinkle round. A bicone crystal in chartreuse on either side of these finishes it off beautifully. I've included over 30" of white ribbon that can be used to hold the pendant if you want to wear the scarf and jewelry piece separately.